Ford Mustang Cargo Capacity Pros and Cons | Page 1 of 1 | Why Not This Car? What drives people to buy (or not buy) a certain car? 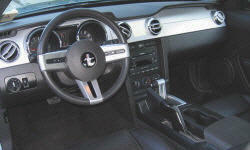 TrueDelta's members share Ford Mustang pros and cons based on their real-world driving experiences. Despite its broad rear fenders, the Camaro has one of the smallest trunks you'll find in any car. Even the Mustang's trunk is about 50 percent larger and has a much wider opening. Interior storage is also in short supply. Very limited cargo area with convertible. Wish it has a possibility of a hidden hitch for a bicycle rack. The trunk is alright, but interior space is not well utilized. Small back seat, small trunk, no towing capacity. Then again, if you bought a Shelby GT500 for towing, you should see a doctor. What cargo capacity? 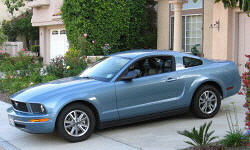 :-) We really like the Mustang but it is not practical for a family car. Very small trunk, but this is not a car for hauling stuff around.